Jack Nicklaus has won 18 men's major golf championships, more than any other man. 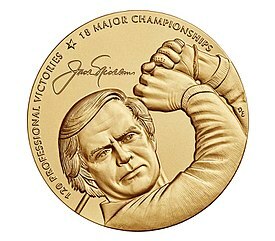 Jack Nicklaus has won the most majors, achieving 18 victories during his career. Second on the list is Tiger Woods, who has won 15 majors to date; his most recent major victory was at the 2019 Masters. Walter Hagen is third with 11 majors; he and Nicklaus have both won the most PGA Championships with five. Nicklaus also holds the record for the most victories in the Masters, winning the tournament six times. Additionally, Nicklaus shares the record for the most U.S. Open victories with Willie Anderson, Bobby Jones and Ben Hogan, each winning four times. Harry Vardon holds the record for the most Open Championship victories, winning six times during his career. Nicklaus, Woods, Hogan, Gary Player and Gene Sarazen are the only golfers to have won all four of the majors during their career, thus achieving the so-called career slam. "Masters Champions". Masters. Archived from the original on October 12, 2013. Retrieved August 19, 2011. "Past Champions". U.S. Open. Retrieved 26 October 2008. "Open Champions". Open Golf. Archived from the original on 2 March 2010. Retrieved 24 October 2008. "PGA Championship". PGA Media Center. Retrieved August 20, 2011. ^ Harig, Bob (7 April 2008). "Golf's professional Grand Slam has developed over time". ESPN.com. Retrieved 7 April 2008. ^ Jenkins, Dan (1 June 2001). "A slam by any name : Tiger Woods makes history at Augusta". Golf Digest. Archived from the original on 3 June 2006. Retrieved 24 October 2008. ^ Dodd, Mike (21 August 2006). "Tiger cruises to 12th major title with easy win at PGA Championship". USA Today. Retrieved 24 October 2008. ^ Lillywhite, Jamie (16 June 2008). "Woods seals dramatic US Open win". BBC Sport. Retrieved 24 October 2008. ^ "Walter Hagen profile". World Golf Hall of Fame. Retrieved 1 February 2016. ^ "Championship Record Book". PGA Championship. Retrieved 22 September 2008. ^ "Champions". Masters. Archived from the original on 19 January 2008. Retrieved 21 January 2008. ^ "Champions". US Open.com. Archived from the original on 3 March 2008. Retrieved 26 April 2008. ^ "Do You Know (Question 48)". The Open Championship. Archived from the original on 6 August 2011. Retrieved 8 April 2010. ^ Harig, Bob (11 June 2014). "Career Grand Slam has grown in stature over time". ESPN. Retrieved 13 April 2015. ^ Hack, Damon (15 May 2008). "Setting a new standard: Bobby Jones wins the Grand Slam in 1930". Golf.com. Retrieved 22 July 2013.